Also Recommended: El Cazador de la Bruja; Ghost Hunt. Notes: There is also a manga by Haruta Mayuzumi, published in Line. A young woman named Baileu Ton arrives in London, along with her friend Mu Shinyao, but Ton's luggage gets promptly stolen. Her search for it leads to a coffee house called Café Forbidden, and its staff of four Umbras, supernatural creatures somehow given material substance from the collective human imagination. These particular Umbras call themselves the Twilights, and battle evil umbras, as well as struggle against human adversaries committed to their destruction- as well as to other sinister purposes. I've never read any of Stephenie Meyer's Twilight books, nor seen the film adaptations, but I know the general scenario is that a young woman is in love with a handsome vampire, and that there's also a handsome werewolf character who is kind of a rival for her affections. So THAT aspect of this show, including the use of the WORD "Twilight", seemed a bit derivative. Our vampire Umbra here is named Vlad- though not Tepes; it's Garfunkel here- and our werewolf is named Luke Bowen. Luke has a wayward brother, also a werewolf, named Chris, who becomes a major player in the story. 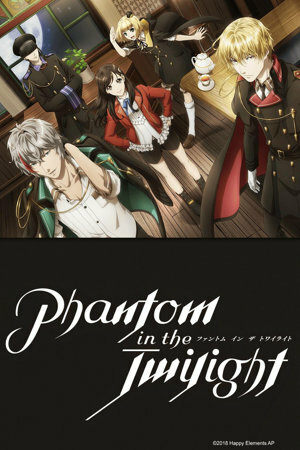 THIS Twilight is both a shonen and a shoujo show, though- in fact the OP is of the former kind, and the ED the latter. For the shoujo, we've got Vlad's instant attraction to Ton- based on his notion (which may even be correct) that Ton is the reincarnation of her own great-grandmother, Sha Rijan, a mage whose own power grew to the point where she became an umbra herself- and whom Vlad was apparently very much in love with, in the day. Before Vlad can try to pick up where he left off, with the great-granddaughter of his lover, a few missing items must be recovered. The easier one is Ton's luggage. The HARDER one to get back is Ton's pal Shinyao. Now I very much liked the character designs in this show, but I particularly liked Shinyao's for some reason (a bit more than Ton's), and Shinyao IS a sweet girl, but she spends nearly the whole show as a captive/damsel-in-distress, and with a pronounced case of Stockholm Syndrome to boot. She's captured at one point by a mixed bag of bad guys that includes the 13th descendant of Van Helsing and his group of Umbra-Haters-On-General-Principles, who are in apparent (though obviously uneasy) alliance with a guy with a monocle (and VERY strange hair) named Haysin, along with a computer nerd character only known in the show as Backup. As each of these parties are defeated in turn, the agenda(s) of the next one(s) in line are finally revealed. Don't get me wrong; I LIKED this show. But certainly not five stars worth, and not quite even four. One problem I had was that it becomes obvious that our Twilights are very hard to kill. (This is apparently NOT true of all Umbras even though all of them, we're told, draw their strength from the human imagination.) After it was shown that our heroes ARE so tough to destroy, I never got the full sense of peril or concern for our heroes' safety that would have helped engage my interest in their battles. The battles also seem much less elaborately choreographed than some I've seen. (Modern cinema's raised our expectations; we've become kind of spoiled that way.) During the show we will kind of see the "birth" of one of the weaker, non-human-appearing Umbras. There will also be one episode NOT connected to the effort to rescue Shinyao, in which the Twilights try to help an Umbra who's brought them a problem, but given the solution they come up with, it might have been better for her if she hadn't asked. I guess I was also a little prejudiced against the show because I find the whole heroine-as-reincarnation-of-the-vampire's-lost-love business overused; it's been a staple of vampire films, including supposed adaptations of Dracula itself, though if memory serves nothing like this was in Bram Stoker's original; I think it might have started with the Christopher Lee/Hammer Studios vampire films. Again, I haven't read Meyers' books, but as for our werewolf HERE, I didn't feel that Luke was much serious competition for Ton's affections; I think she found him a bit too touchy-feely. So the principal trio interested me less than the other two Twilights, named Toryu and Wayne. Toryu is a jiangshi, which seems to be a kind of animated doll that was originally a weapon aimed at Rijan, but who was brought under her control- or, more precisely, was liberated from the control of others. Toryu's bangs conceal more than just his eyes. He talks softly, but carries a big (mini)gun as well as other smaller (but still formidable) weapons, and I guess there's always something to be said for having lots of firepower. (Guys tend to like this sort of thing. It's a boy thing of course.) Wayne, on the other hand, is a ghost- or at least the most common manifestation of him is- that can animate inanimate objects (at the Café, he mostly inhabits a mannequin when he needs a physical body), but his most useful ability is being able to enter electronic devices, including as a digital presence on the internet, where he can access other computers, cameras, and the like. He's very agreeable and helpful, but he has an alter ego that's a bit more corporeal, AND very different in personality, from his usual self. And that's about it. It's got attractive character art, particularly interesting characters (in my opinion) in Toryu and Wayne, and was otherwise- well, not moving me that much. Maybe it was because the setup with the principal trio seemed...overdone. Maybe it was because the show does shonen better than shoujo, but neither with the kind of enthusiasm that each respective one would need to actually be effective. (Though I have to admit I did like that little bit with the deus ex machina character in the final episode!) It's pretty apparent that this is just the opening part of a longer saga; Wiki says the manga actually started in March of this year (2018), so this can't represent more than the very beginning of the run for these characters. This would also imply that there wasn't much time to develop this show, which might help explain its weaknesses. Recommended Audience: Fantasy violence, peril. No fanservice that I can recall. We'll say PG-13.